A completely unique and visually stunning double sided fireplace features a circular centre piece with a striking exposed flue that stretches up to the ceiling. Custom designed to fit between the floor and the ceiling and part closed with glass blades it allows a two sided view of the flames. 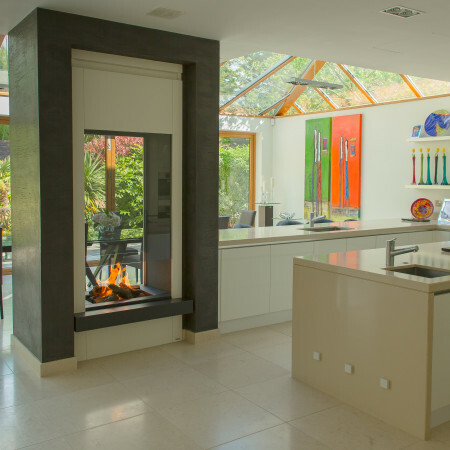 The outside of the fireplace can be finished in an array of colours and finishes and as an added and unique extra it can be designed to rotate allowing the fireplace to be viewed from anywhere in the room. The 997 is beautiful feature double sided fireplace that is a perfect integration to a large open space to give a year round focal point.